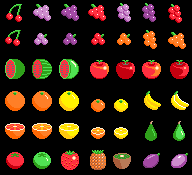 A nice collection of common fruits are included: apples, cherries, melons, oranges and so on. 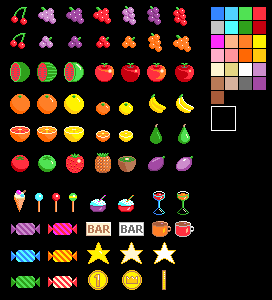 And also there are some candy, ice cream and other things such as stars and coins for those "fruit machine" games. These look awesome. I'll be using them in my game "Hungry Monkey" for the #BaconGameJam. Love these fruits, have an eggplant, which is not a fruit, but is CC0!